Coal is the second largest segment in Russian ports after crude and oil products. Its growth rates are kept high and there are prospects for further increase, not without certain risks, though. According to the Association of Commercial Sea Ports of Russia, coal traffic via the ports of Russia in 2016 grew by 10.5%, year-on-year, to 136.3 mln t. So coal, together with oil, is the main driver of domestic ports development. The more so, as oil exports can reduce due to international agreements. Coal exports in 2016 grew in all basins of Russia with the highest growth shown in the Far East Basin (+15%) accounting for the largest share (more than 80 mln t per year). The key prospects of coal terminals development are also associated with the Far East. The fastest growth of coal consumption is seen in the Southeast Asia. The International Energy Agency (IEA) forecasts the demand for coal to grow by 4.6% per year in that region, up to 2040. One of the most promising coal markets is that of India, where 67% of the population has no access to electric power. In view of the development of the country’s steel industry, import of metallurgical coal is expected to grow there. Vietnam, IEA says, will become a net importer of coal though it used to export considerable volumes of coal before. This is because of fast growing energy industry and economic growth of the country. Significant growth of coal demand is expected in Bangladesh, which has announced projects involving coal consumption. On the other hand, the demand of traditional importers, S. Korea, Japan and Taiwan, can decrease amid their policy of power energy diversification. Yet the demand of those countries can be supported by new projects involving coal and the abandonment of nuclear sources in Japan. As for China, the largest player in the coal market, the analysts forecast a slight decline of the demand in the nearest future followed by stabilization there. Moving westwards, it should be noted that certain growth of the demand is expected in Pakistan, Turkey, Marokko and Egypt. The demand for coal in the USA and in Europe is to decline. In the USA – due to cheap natural gas and environmental legislation, in Europe – due to the development of alternative energy sources. In general, global coal market is to grow by 2021, though it will not exceed the level of 2013. For Russia this means the need of forward investments into transport infrastructure for eastward coal exports, debottlenecking of railways and construction of new port facilities. Otherwise, the promising Asian market will be divided between the competitors from Australia, Mongolia and South Africa. The most dynamic development in the Far East Basin is demonstrated by Vostochny Port JSC. In 2017, the company will put into operation the third phase of its dedicated terminal allowing for annual exports of Russian coal to reach 39 mln t by 2019. The coal will be delivered from Kuzbass and other coal fields of Russia. Besides, Deputy Prime Minister of the Russian Federation Arkady Dvorkovich has recently given instructions on construction of Vostochny-Nakhodka railway hub in the Primorsky Territory. Together with the Consumer Council and other stakeholders, Russian Railways President Oleg Belozerov is instructed to introduce amendments into the master plan on the development of Vostochny-Nakhodka railway hub. The hub capacity should be expanded with additional 20 mln t by 2019 in view of the guaranteed growth of Vostochny Port JSC throughput. RF Transport Ministry is to develop proposals on comprehensive implementation of the Vostochny-Nakhodka project by 2020 with off-budget financing through concessions. 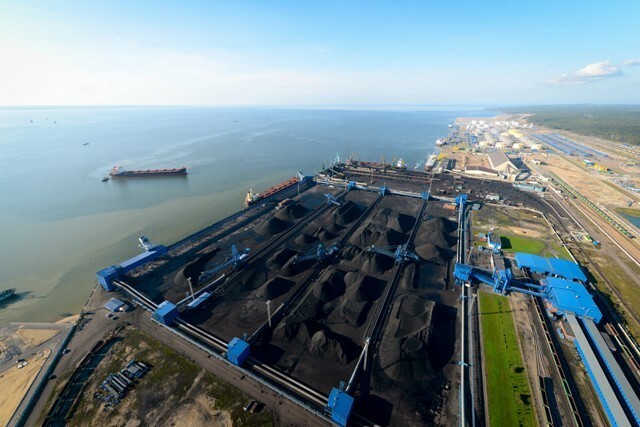 IAA PortNews believes this measure will let complete the construction of another coal terminal at port Vostochny – Sever (the Russian for North). State customer of the Sever terminal is FTI Rostransmodernizatsiya. Operator of the project – Summa Group. As of today, the construction of the facility included into the Vostochny-Nakhodka project is behind schedule. Moreover, the project of Sakhatrans at Vanino port is nearing the phase of implementation. First supplies of equipment are expected at the construction site in April 2017. Other projects on construction of coal transshipment facilities in the ports of Russia’s Far East previously covered by IAA PortNews are still at the “paper phase”, and there are many of them. In the Southern Basin, the development of coal terminals depends on the geography of demand growth outlook. In his context, high hopes are associated with the Taman dry cargo port project. In 2016, coal transshipment via the Southern Basin grew by 4.4%. The western direction, where no growth of demand is expected, still lacks coal transshipment facilities. More than 16 mln t of Russian coal is still exported via the port of the Baltic Sea, read more >>>> The hopes here are associated with the Murmansk Transport Hub and port Lavna projects as well as the development of coal transshipment in Ust-Luga and Vysotsk. Russia’s largest coal terminal in the Baltic Basin, Rosterminalugol, achieved a record-high result in 2016 – 18 mln t.
An evident risk coming from the creation and expansion of coal terminals is eco-risk. Nevertheless, it can be managed through introduction of new technologies of environment protection as it is done by Vostochny Port and through shifting of terminals further from residential areas. For example, Murmansk Transport Hub is based on that principle. To summarize, it should be said that the development of dedicated deepwater coal terminals equipped with the latest systems of environment protection is needed in all key basins of Russia. Otherwise we risk keeping this coal and leaving the promising market to our numerous competitors.